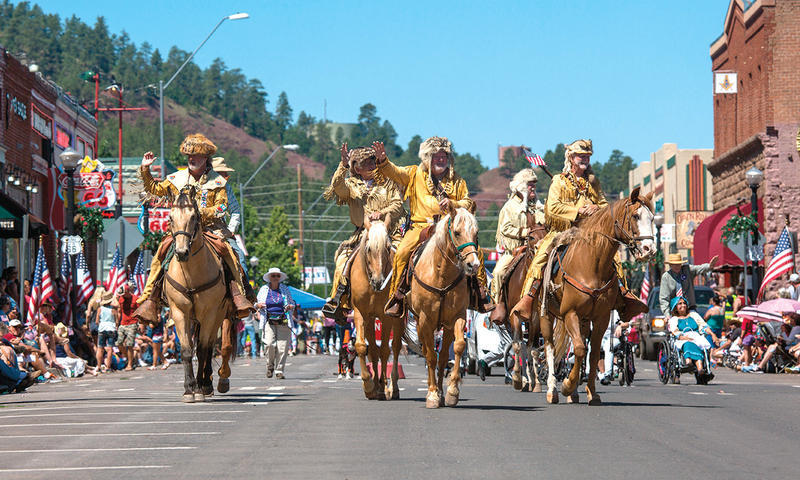 One of Arizona’s most popular Independence Day celebrations is Williams’ Hometown 4th of July Parade down Route 66 (Main Street), featuring the ever-popular Bill Williams Mountain Men, the unofficial ambassadors of Arizona. Arizona’s scenic highways and welcoming Old West communities make the Grand Canyon state one of the best places to spend a week or two, or more, on an Old West road trip. Traveling its byways and highways takes the driver near, alongside—or even on—its earliest trails, wagon roads and railroads. 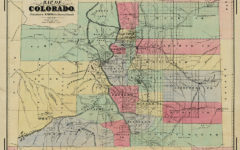 Since the state’s first two transcontinental railroads, the Southern Pacific and Atchison, Topeka & Santa Fe (originally known as the Atlantic & Pacific), were built across the Arizona Territory in the 1870s and 1880s, the rail companies and Arizona’s boosters have promoted tourism to its cities and natural wonders. The railroads were the preferred way to reach Arizona well into the 1940s, but with the rise of automobile travel and tourism on the new U.S. highway system constructed in the 1920s and 1930s, the car and truck later became the preferred way to visit the 48th state. 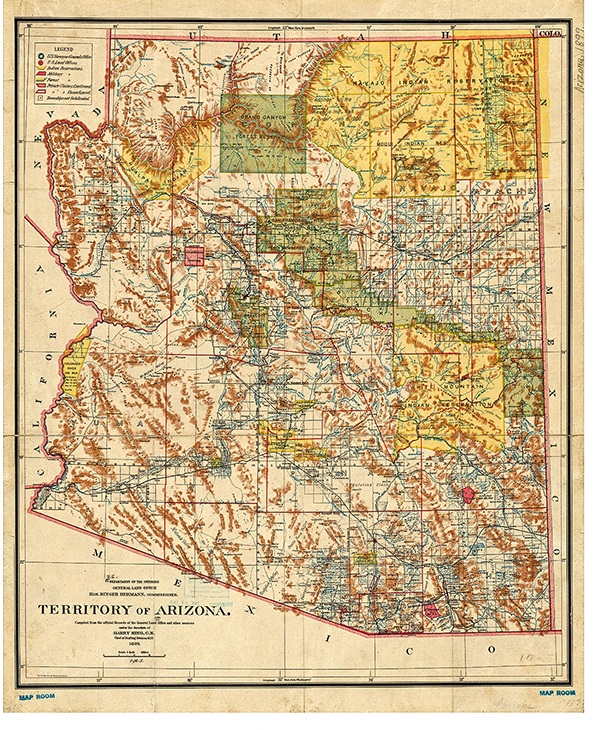 By 1884, the Arizona Territory boasted two transcontinental railroads and a well-established network of trails and roads, many of which would become modern paved highways, including Route 66. Today, many intending to visit northern Arizona and the Grand Canyon forgo the extended cross-country road trip and fly to Las Vegas or Phoenix, rent a car, and make the drive to the state’s historic railroad and Route 66 cities via the interstates. 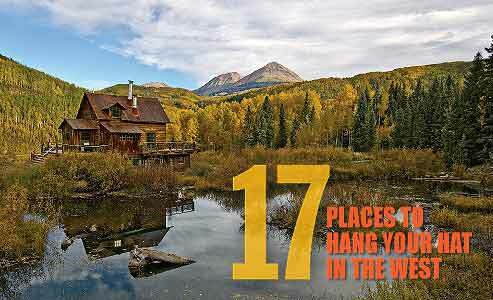 Either way, the drive from Las Vegas or Phoenix is a scenic experience with great roadside stops along the way. If driving to Flagstaff from Phoenix on I-17, fuel up with a great meal and a piece of pie at the Rock Springs Café, an hour north near Black Canyon City. In 2019, the Grand Canyon Railway Hotel in the mountain town of Williams is the perfect headquarters for the northern third of an Arizona vacation. Stay at the hotel and walk out the front door to board the historic Grand Canyon Railroad for a scenic ride to the world-renowned natural wonder. The heritage line offers daily round-trip passenger service to the park, as well a variety of special trains, plus overnight packages including a stay at one of the Canyon’s hotels. Williams is a welcoming community with activities, sites, museums and annual events for all ages. As the last Route 66 city to be bypassed by I-40, downtown Williams has a rich “Mother Road” culture of Route 66 shops, museums and restaurants to be explored, while the Williams Depot History Museum recounts the town’s storied rail history. Just outside of town are two tourist favorites for animal lovers, families and the younger set: the Grand Canyon Deer Farm and the Bearizona Wildlife Park. 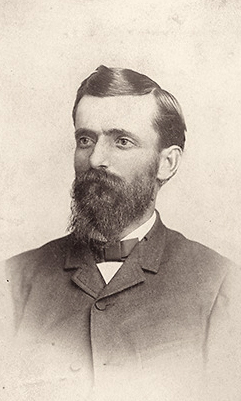 Kingman’s Mojave Museum of History and Arts exhibits explain in depth about Lewis Kingman’s (inset) role in local history, and how the railroad he engineered led to a legendary era of boom and bust mining camps in Mohave County. After enjoying Williams and the Grand Canyon, spend a few days exploring the historic route from Williams to Kingman. Originally known as Beale’s Wagon Road, named for Lt. Edward F. Beale, U.S.N., who surveyed the route with his famous—albeit short-lived—Camel Corps in 1857-’58, the overland wagon road later became the route for the Santa Fe Railroad and U.S. Route 66. Driving west from Williams, I-40 leads to a crossroads with Historic Route 66 in the town of Seligman. Go right on 66 and enjoy a nostalgic 87-mile drive on the “Mother Road” to Peach Springs (gateway to the Hualapai Indian Reservation’s Grand Canyon East Resort) and ultimately, Kingman. In Seligman, don’t forget to fuel up your vehicle with gas and yourself with a meal at the famous Delgadillo’s Snow Cap Drive-In. Founded in 1882, Kingman is the Mohave County seat, a mecca for trail, rail and automobile historians, with Route 66 fans visiting Bob Boze Bell’s hometown from around the world. When exploring Kingman, start at the visitor center in the Historic Powerhouse and tour the adjacent Arizona Route 66 Museum. Across the street in the old Kingman ballpark is the famous 1928 Locomotive #3759, symbolic of Kingman’s rail history. The renowned Mohave Museum of History and Arts should not be missed and will give any visitor to the high-desert city a great primer on local history, including Beale’s famous road. The Palace Restaurant and Saloon’s famous bar was saved during the July 14, 1900, Whiskey Row Fire in Prescott and is still making history and memories on Montezuma Street across from the historic Yavapai County Courthouse Plaza. Even before the Santa Fe Railroad arrived in Ash Fork in November 1882, the town—and its water supply—made the little burg an important crossroads in northern Arizona. Doubling-back from Kingman on I-40, head south on S.R. 89 to Prescott, your headquarters for the central Arizona portion of the statewide tour. The highway approximately follows the old stage road and SFP&P rail line past the headwaters of the Verde River and through Chino Valley to the original Arizona Territorial capital city. Arizona 89 enters Prescott through Granite Dells and bypasses Fort Whipple, founded in 1864 and currently a V.A. medical facility. Stop at the Fort Whipple Museum, a branch of Sharlot Hall Museum, housed in a former Army officer’s home and providing a snapshot view of central Arizona wfrontier life during the Apache Wars. From Fort Whipple, follow the highway signs to Gurley Street and Prescott’s historic downtown Courthouse Plaza. Parking abounds downtown (although on busy weekends, I recommend the parking garage behind Montezuma/Whiskey Row). Enjoy a stroll amid the park’s shade trees and monuments, including the renowned Rough Riders monument built in honor of local Spanish-American war hero killed in combat, Sheriff Buckey O’Neill. From the Plaza, stroll in any direction and you are guaranteed to discover interesting shops, antique stores, breweries, restaurants and the infamous Whiskey Row, anchored by the oldest operating bar in the state, The Palace Restaurant and Saloon. 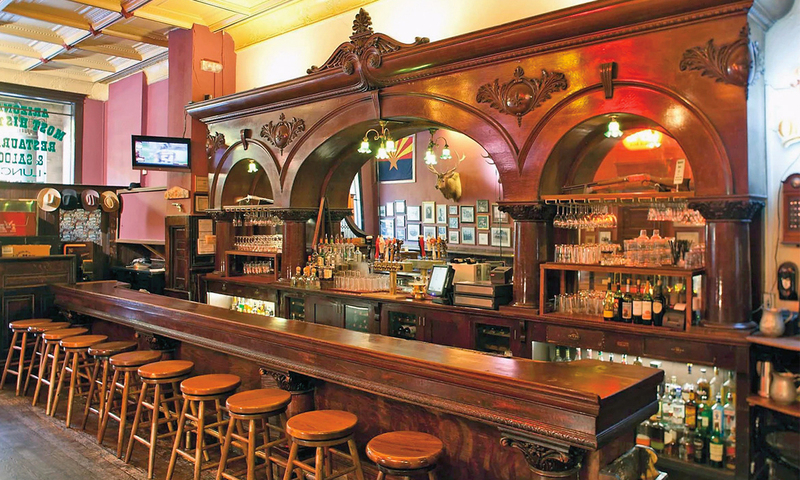 Stroll through the Palace’s swinging doors and step back in time and enjoy a Western-style steak or rack of ribs in the dining room that was once a crowded dance floor featured in the 1971 film Junior Bonner. Don’t miss the mural dedicated to the movie on a back wall in the dining room. collections of art north of the Phoenix metro area. Staying on the trail, rail and automobile tour, follow Arizona 89 south from Prescott through Kirkland Junction and Yarnell to a crossroads in the old mining town of Congress. Continue south on 89 to 93 to Wickenburg for an overnight of Western hospitality, a very walkable downtown district and a tour of the world-class Desert Caballeros Museum. The route, the first federally funded U.S. highway in Arizona, and known as the White Spar Highway, parallels the Hassayampa Trail and the old Santa Fe, Phoenix and Prescott rail line. From Wickenburg, continue south on U.S. 93/60 to its junction with S.R. 74 east to I-17 and the Carefree Highway. Ten miles east of the interstate juncture, turn north onto Cave Creek Road, which leads to the historic ranching-mining-artist-tourism colony of Cave Creek and True West magazine’s World Headquarters. 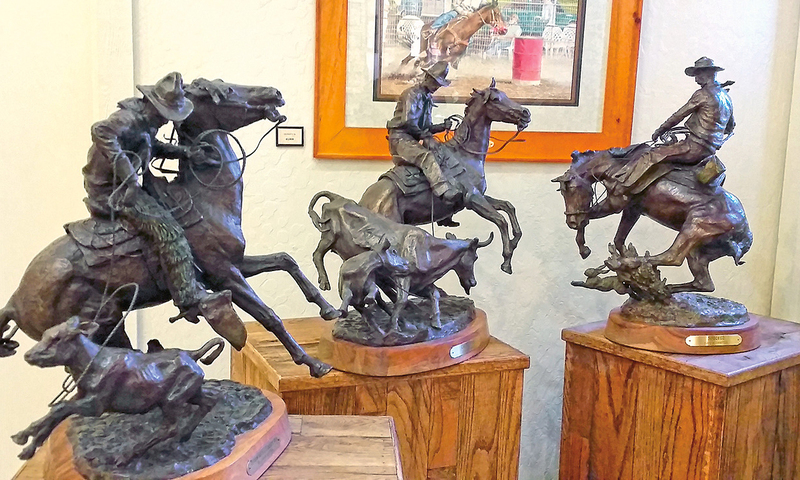 Visitors to Cave Creek will enjoy touring the Cave Creek Museum and its cultural, historic and art exhibits, including a fine collection of Western bronzes. Unlike the northern and central Arizona cities on this cross-state tour, Cave Creek was never serviced by a railway. 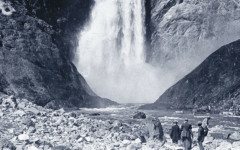 It was named for landmark caves along the creek, adjacent to the Fort McDowell Military Road that connected to the Stoneman and Black Canyon roads north to Prescott’s Fort Whipple. Cave Creek’s first settlers were miners and ranchers. Today, it’s is a popular vacation and day-trip destination. Every March, the town hosts its biggest annual event, Cave Creek’s Rodeo Days and Parade. Visitors will enjoy immersing themselves in Cave Creek’s Western community of shops, restaurants and eclectic bars, with overnight accommodations in town and in nearby Carefree to fit most budgets. The fastest route from Cave Creek to Tucson for the southern third of the road trip is back west on the Carefree Highway to I-17 to its merger with I-10 southeast to Benson. But, if time permits, spend at least a night in Old Scottsdale and visit the world-class Western Spirit: Scottdale’s Museum of the West and enjoy a walkabout in the art gallery-restaurant-tourism district of Main Street and Fifth Avenue. Interstate 10 arcs south and east to Benson, a historic Southern Pacific railroad city founded in 1880 about 43 miles past Tucson. The highway to Benson parallels part of the Gila Trail south of Maricopa and the state’s first transcontinental railway (today it is part of the Union Pacific Railroad system) and is a gateway to Cochise County’s famed cities on State Routes 90 and 80: Sierra Vista, Fort Huachuca, Bisbee, St. David, Tombstone and Douglas. 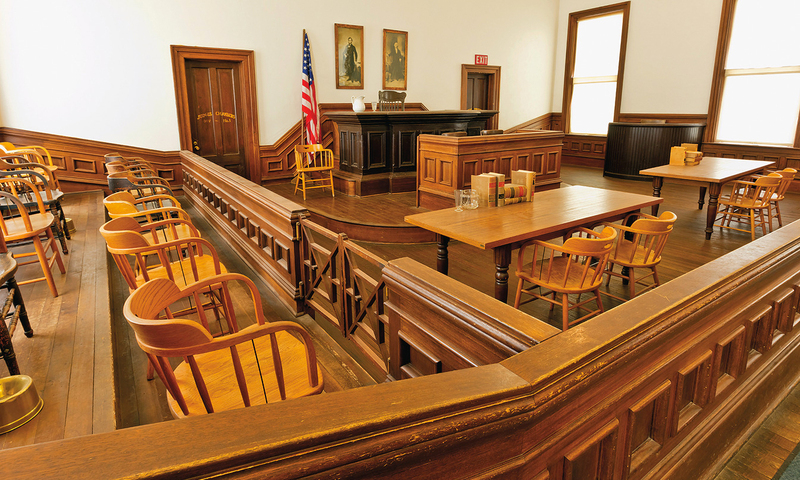 A tour of Cochise County’s most significant territorial sites should include the Tombstone Courthouse State Historic Park and its outstanding museum collection highlighting the local history during the Earp-Clanton era. If Old West history is your passion, then Arizona’s Cochise County is a destination worth returning to year after year to experience its annual seasonal events, historic sites, towns and monuments. Tombstone’s unique Monument Guest Ranch with its faux frontier town façade is centrally located and a great place to hang your hat when on tour of the historic mining camp’s museums, including Boothill, The O.K. Corral and Historama and the Tombstone Courthouse State Historic Park which provide a strong introduction to local history, as do the guided stagecoach tours of “the town to tough to die.” Mile-high Bisbee’s historic district is a short half-hour away. Take the retired-miner-led Queen Mine Underground Tour, enjoy a meal in the Copper Queen Hotel and visit the Bisbee Mining & Historical Museum. Drive on to Douglas on S.R. 80 and discover the John Slaughter Ranch, dedicated to preserving the history and environment of the ranch, once owned by the Texas pioneer rancher, but began as a Mexican land grant almost 200 years ago. 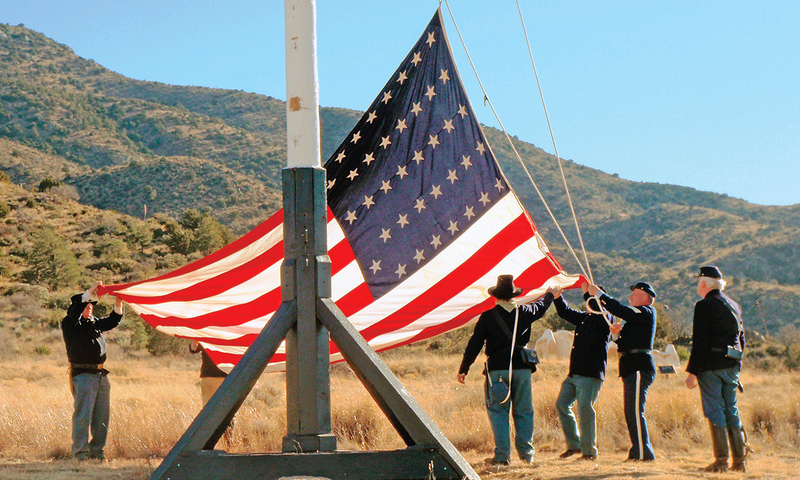 Re-enactors lower the flag at the end of the day at one of the regularly scheduled living history events at Fort Bowie National Historic Site, southeast of Willcox in Cochise County. While staying in Tombstone trail on up S.R. 80 and I-10 east to the railroad-ranching town of Willcox. After the dust settled outside the O.K. Corral, the silver mines busted in Tombstone and all the Earps were gone (except for Warren, who was shot, killed and buried in the town’s Pioneer Cemetery in July 1901), cattle ranching and farming took over the local economy. 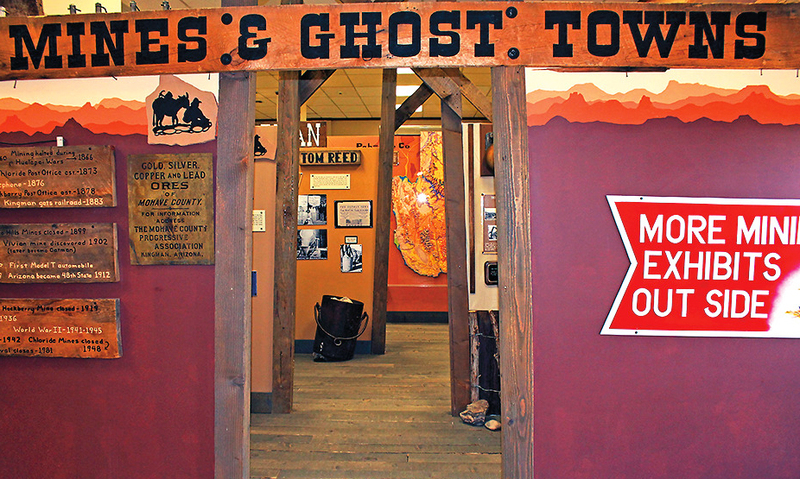 Learn more about Willcox and the county at the Chiricahua Regional Museum and Research Center, tour the Rex Allen Arizona Cowboy Museum and Willcox Cowboy Hall of Fame (see Jana Bommerbach’s column on p. 18) and then relax over a well-earned dinner at Big Tex Bar-B-Que. You’ll definitely need it—because you might just extend your trip another week to explore the Dragoon and Chiricahua mountains, hike to Fort Bowie National Historic Site and visit the ghost towns of Cochise, Pearce, Courtland and Gleeson before returning back to Tombstone via the awe-inspiring drive on Middle March Pass between U.S. 191 and S.R. 80. 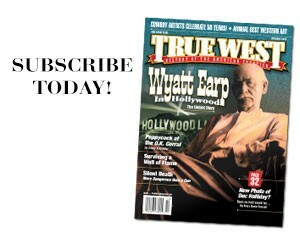 Stuart Rosebrook is the editor of True West magazine and co-author with his father, Jeb Rosebrook, of Junior Bonner: The Making of a Classic with Steve McQueen and Sam Peckinpah in the Summer of 1971.